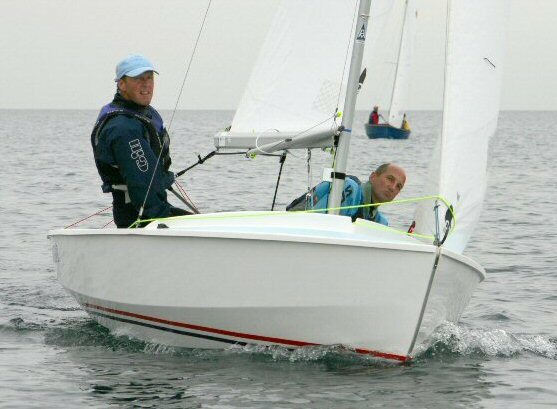 1st: Ian Porter and Kevan Gibb of the Hayling Island SC on Chichester Harbour near Portsmouth, England arrived a week early, and demonstrated championship form and class throughout their stay. They supervised the un- and reloading of containers, helped those in need, practiced each day and generously shared what they were learning with those of us too busy socializing and drinking beer to find time to practise. Then Ian and Kevan went out and won 7 of the 8 races they sailed, leaving no doubt that they are the best team in the Wayfarer world. Congratulations on a very well earned victory, Kevan and Ian! 2nd: Toby Mace and his energetic, most capable young crew, Rachael Rhodes of the Waldringfield SC on England's east coast consistently sailed extremely well. In keeping with their outstanding ability to handle and move their Wayfarer superbly, Toby and Rachael never opted for the easy way by banging a corner, and were the only boat to drop two top-10 finishes on their way to a clear and well deserved 2nd place among the 59 entries. 3rd: Also counting only single-digit finishes were Toby's Waldringfield club mates, Gordon Harris and his daughter, Emma. They, too, sailed consistently well and were right in the hunt for the runner-up spot until the final race where they fell just short of catching Toby. 4th: Neil Fletcher and Chas. Edwards, another of the powerhouse Waldringfield entries, Like their WSC club mates, they sailed unnervingly fast and well on a consistent basis in their glass Wayfarer, and might easily have done better than series 4th had they had better luck in a pair of light-air races where they fell to 18th and 21st. 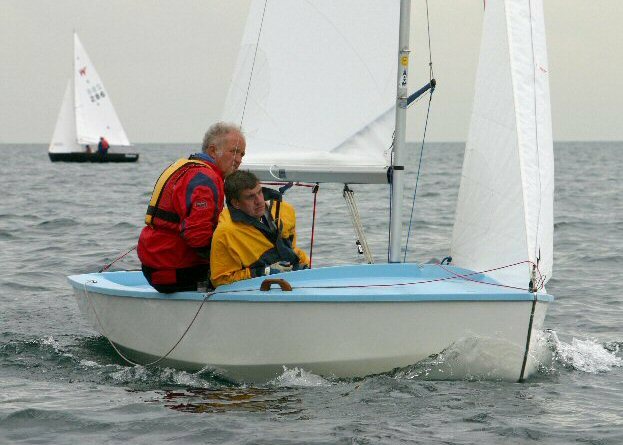 5th: The Norfolk Broads YC team of Graham Barker and his son, Robin, made it 4 of the top 5 for England's east coast. An impressive perfect start at the favoured pin end in the finale enabled the Barkers to grab a lead they would hold to the finish and to sneak into series 5th to cap an impressive series. 7th: A veteran of 6 Worlds over the past 15 years Guy Hacon with Daniel Watson of - where else??!! - Waldringfield, Guy had his best result yet this year - improving on his previous best Worlds finish, a 10th in '95 in Toronto. Daniel and Guy had one bad day in this series or they might well have placed higher. On the Friday, they twice went swimming in the waters of Lake Ontario. Otherwise, they were consistently near the top, their highlight being race 5 where they placed a close 2nd to Ian Porter. 8th: That would be us! In honour of this Worlds - and after some tsks of disapproval from Hans Gottschling, Marc Bennett and I repainted SHADES and killed thousands of bugs in the process. We spent a lot of pub time discussing our strategy and were hoping to be reasonably placed by avoiding bad starts and by sailing conservative first beats. Except in race 8 where we finally decided we had earned the right to bang a corner (the wrong one, as it turned out! ), we did get decent starts and sailed what we felt were mostly sound first beats but we still managed to reach the first mark worse than 40th in 6 of the 9 races. Conversely, we were more than pleased with our remaining legs where we recovered enough to fall to fall just one point short of series 7th. And our drops were decent: a 17th plus a DNF when our venerable 1977 rudder blade gave up the ghost on a wild spi reach during which we had recovered to 15th or so. 9th place, a mere two points behind Uncle Al, was a fifth WSC team: Roger Challis and Mark Johnston. Roger and Mark were in a fight for 2nd in race 8 when their mast broke so they lost a lot more than Al did in their breakdown. But both Roger and Al were fortunate that their breakdowns only cost them one race, occurring as they did, in the third of three back-to-back races. 10th: Leading the Irish contingent was Jay Colville of the East Down YC on Strangford Lough near Belfast. 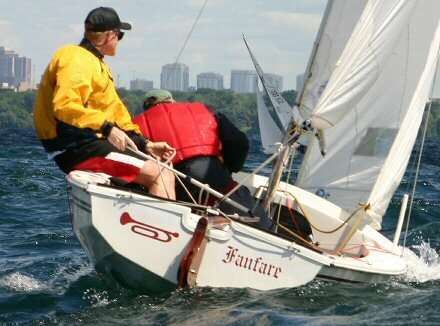 Jay's crew was Ian Harley who is currently interning with Knox Ritchie, a Toronto Sailing & Canoe Club Wayfarer. After a slow 13-28-12-10 start, team Colville/Harley was riding a streak of top 5 finishes but had to count a 15th from the light-air finale and ended up 3 pts. behind Roger. After placing 34th in his first Worlds in 2001, Jay and Ian had to be pleased with this much improved result nonetheless. 11th: Montreal's Peter Rahn and son, Alex, edged out a pair of UK crews by 3 pts while improving by 7 places over their previous Worlds finish, an 18th when Alex was only 9 in 1995. The Rahns had fine speed and got off to several good beginnings. Peter and Alex were, for instance, leading race 5 for the first sausage but feels his "seat of the pants" approach was costly, losing him boats later in this and other races. 12th= John Goudie and Suzanne Hall of the Wilsonian SC on the River Medway east of London, England made significant strides from their 28th in the previous Worlds. 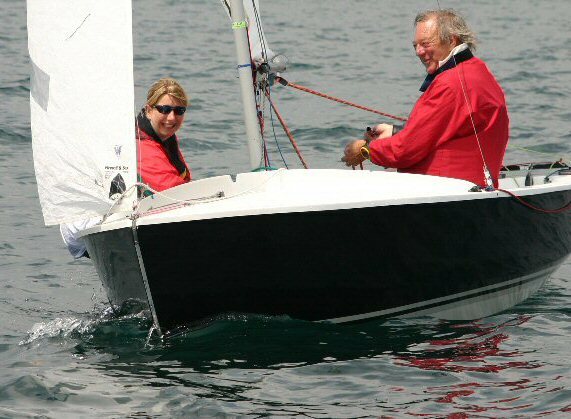 John and Suzanne were the only boat to beat Ian Porter in any of the races when they won race 2 and the CWA Wayfarer Trophy in light, very tricky winds. Delayed gratification was a problem though, as they and their pursuers remained unaware that the race had been shortened to only two legs and struggled up a close reach into a very light breeze and strong current when all the while, they should have been basking in the glow of victory. 12th= HISC's John Hartley and Nick Philp also improved significantly over their 2001 Worlds début (26th) in the lovely wooden Fantasia. They started the series with three fine finishes, including a pair of back-to-back 2nds, in the first four races but could not hold this top form. A light-air 19th in the finale ultimately dropped them behind Team Rahn and into a tie with Team Goudie in the final tally. 14th: Stewart Reed and Robin Albert of the Bosham SC - John Hartley's Chichester Harbour "neighbours" - sailed a solid, consistent series that included three top 10 finishes late in the series once they had gotten warmed up by doing the necessary amount of partying. Their 14th was a vast improvement over Stewart and Robin's first Worlds finish of 36th in 2001. 15th: The pride of the Mississauga Wayfarer fleet, Mark Taylor and his brother, Paul, started slowly but scored single digit finishes for the last half of the series and ended up only two points behind Stewart. This was far and away the Taylors' best Worlds after a 36th in Toronto in '95 and a 55th in their borrowed and aptly named Yellow Submarine at Egå in '98. 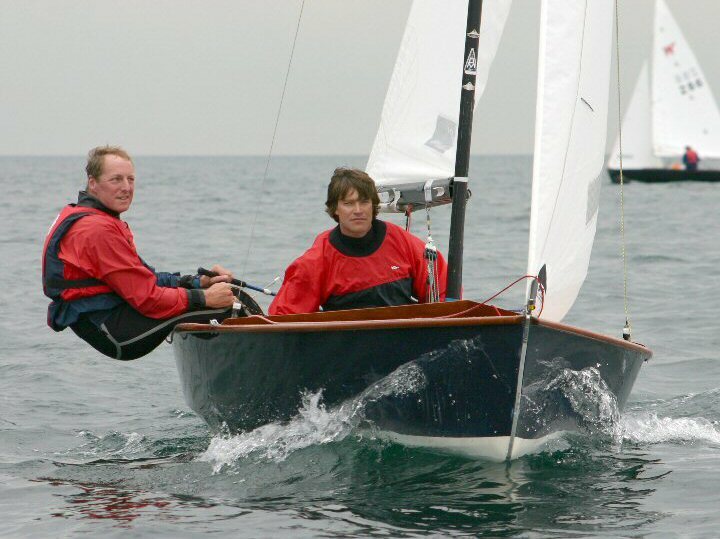 16th: Michael McKechnie and Simon Turner of the Royal Harwich YC (another of England's east coast W speedsters!!) entered the last race tied with the Taylor "boys" to whom they lost the race and the series by one place. Michael and Simon scored three top-10 finishes in this series, their first Wayfarer Worlds where they were the best-placed "Rookie" crew. Well done, guys!! 18th: Heider Funck and Tom Wharton of Mississauga sail out of the TS&CC. Seeded 2nd among the North Americans, Heider and Tom were unable to hold good early positions the few times they got them and ended up 5th among North American entries. What had to be a frustrating series for these two veterans was epitomized by their final race, in which they became the only boat in the entire series to be hit with a Z-flag penalty. 19th: Finishing 2nd among the five borrowed boats were Brian Lamb and Tony Hunt of the Wilsonian SC in W8261, an Abbott Mark III borrowed from TSCC's Ken Devlin. Although the 19th was an improvement over his 1998 and 2001 Worlds 27ths, Brian - a French and German teacher like Uncle Al - had hoped to do even better. And he kept hearing "That's a fast boat", a comment he probably ranked right up there with other favourites such as "The dog ate my homework." In the end, the Final Gambol team had to be content with a second-race 4th and an eighth-race 7th as their very commendable series highlights. 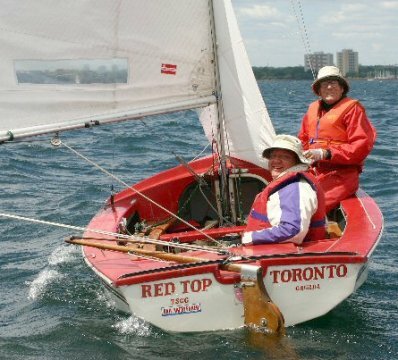 20th: Completing the top 20 were the CWA's very popular Roger Shepherd and Joanne Kumpf, who sailed consistently and well in their Porter-built woodie Invasion. Roger and Joanne's boat speed and handling were impressive throughout the series in which they were seeded 10th but placed 6th among the North Americans. 21st: The veteran Hayling Island team of Ted Gadd and his wife, Wendy, probably deserved to end up far better than they did - perhaps even in the top 10. Unfortunately however, Thursday's weird wave action proved too much for Wendy's stomach, and Wild Billy ended up with 3 DNC's @ 60 pts - one of which they of course had to count. Apart from that, Wendy and Ted had all top 15 finishes except for their 29th in Tuesday afternoon's odd crap shoot. The Gadds ended their series on a high note with a fine 3rd and ended up with three single-digit finishes, the other two being a 7th and a 5th. 22nd: Waldringfield's very own Irishman, Mike O'Malley, and crew, Justin Denny got off to a slow series start but hit their stride in the last half of the series. Only a final-race OCS prevented the Domino team from placing even better. Even so, this was by far Mike's best Worlds result after 34th and 38th in his first two Worlds. 23rd: The young Laderoute brothers, Paul and Alan - long-time 470 mainstays of the Conestoga SC about 60 mi. NW of Toronto - did not fare as well as Uncle Al had expected after they had been major threats in the past two North Americans with old, ragged sails on Unplugged borrowed from club mate, Al Nichols. Even with brand new sails, their lone bright spots were a 7th in race 3, and the final race where they rounded with the leaders off the first beat and held on to finish 12th. 24th: Alan Chaplin, another of the Waldringfield prodigies, was - at 70 - one of the oldest helms in our series. 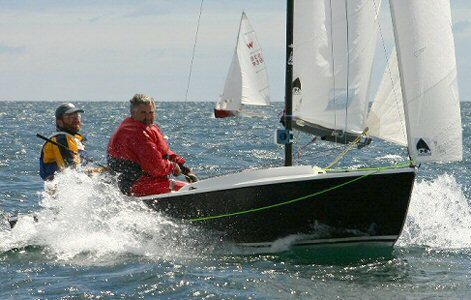 Sailing with his daughter, Lesley, as crew, Alan improved by over 30 places over the 56th he got in his first Worlds in Ireland and ended up a mere 3 points behind the Laderoutes. 25th: One of the most pleasant surprises of this Worlds was the excellent sailing done by the newly constituted team of Kit Wallace and David Weatherston out of TS&CC where they rediscovered each other after having been high school classmates. The Ab faB team was seeded 16th among North Americans but ended up 8th among us here. In a couple of races, they reached the windward mark with the leaders whom they subsequently matched very well, ending up with 10-7 in those races. Well done, Kit and David! It was lovely to see you sailing so well - even when you were "axing" us! 26th: Another vastly improved Canadian team were the brothers Gumley of Ottawa's Lac Deschênes SC. Seeded 20th among NA entries, Andrew and Nigel placed 9th-best among us here, showing consistently good speed and sound strategy despite a serious lack of training time together in Windshadow. This was Andrew and Nigel's first Wayfarer Worlds. 27th: Scoring his best Worlds finish in the last 20 years, Detroit's Nick Seraphinoff with Joe Blackmore steadily improved as the week wore on. The Detroit duo had worked their way up to a fine 15th by the second-last race, but Bush and Cheney were 'impeached' by a call of nature on Saturday morning. By the time nature had run its course, Nick and Joe were late for the last race but still recovered to place a respectable 38th. 28th: Another personal best Worlds finish (after a 60th and a 52nd in 2001 and 1992) was recorded by UKWA Chairman, Liz Feibusch, with Frances Lilley in W10000, Ten Grand, out of the Orford SC on England's east coast. From a North American perspective, Frances and Liz did very well, beating out several very capable Canadian racers on our own home waters. 29th: It took Steve Carroll, the London, Ontario native who mostly sails a Laser out of Toronto's Water Rats SC these days, half the series to get Fanfare and her venerable old sails into gear. With three sound races at the end, Steve and crew, John Attwell, climbed back into the top half of the fleet, and easily improved on the 40th place scored in the wild and windy 1989 Worlds in Denmark. 30th: Perhaps typical of the culture shock experienced by many North American Wayfarers for whom a 15-boat fleet is a big one these days, were Conestoga SC's Dwight Aplevich and Al Nichols. These two are usually a major threat in our racing here, especially in the hiking breezes, but they seemed to get lost in this 59-boat mass. Still, this year's finish was a nice improvement over the 42nd they scored in their first Worlds in '95. Stephan has added the following explanation: "Re the 2 OCSs: in the first race Wednesday, we broke the rudder. We were towed in and borrowed a rudder from Paul Senechal. We flew the spin all the way to the middle of the starting line to find out that there was 30 seconds left to the gun. We just startet and were told later in the harbour that the umpire had hoisted a one-minute-kind-of-flag! So you see we were disqualified one minute before the start with spin hoisted! The second OCS is wrong. We started in second row. But we had to go directly to the harbour after the first run as a taxi to the airport was waitng for us. Whether we get an OCS or a DNF really does not matter." 32nd: An enjoyable learning experience for LDSC's Doug Netherton in his first Worlds for which he lured legendary Canadian Wayfarer crew, Roger Redwin, back into action - all the way from Winnipeg, Manitoba. Doug was 13th among the North Americans, a nice improvement over his 21st seed. 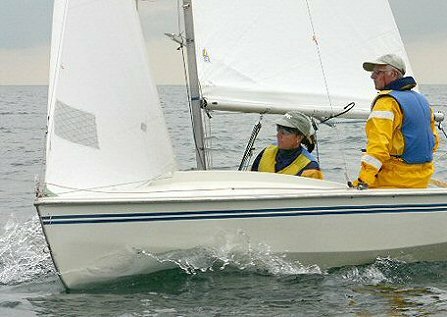 33rd: Those Isle of Man Vikings, John Dowling and Terry Holt, sailed our fourth borrowed boat - W3613, a glass Mk I loaned by Tim Bider - to a solid finish that was a considerable improvement over their 2001 rookie experience in Ireland. John and Terry excelled when the going got toughest, scoring 16-13 in Thursday's final two races. 34th: Four points behind our Vikings was our second EDYC entry, Almera, piloted by Alan Bell and Gordon Reid. Gordon and Alan recovered nicely from an opening-race 44th and ended up finishing this Worlds nearly 30 places higher than their first one at home in 2001. 35th: The legend continues as the 90-year-old George Blanchard of TS&CC maintained his amazing record of having sailed all 12 Wayfarer Worlds over a span of 30 years since 1974. And this was no token entry! With the capable help of Mike Codd, George - in physically quite demanding conditions - beat nearly half the fleet! This from a man who "warmed up" for the Worlds with two solid months of measuring, fixing TSCC club motors, helping neighbours move and towing borrowed boats to PCYC for the Worlds. Thanks, George! We'd be lost without you! 36th: Another good North American Wayfarer (8th seed) who seemed to get lost in the big fleet was TS&CC's Hans Gottschling with Pedro Santos. 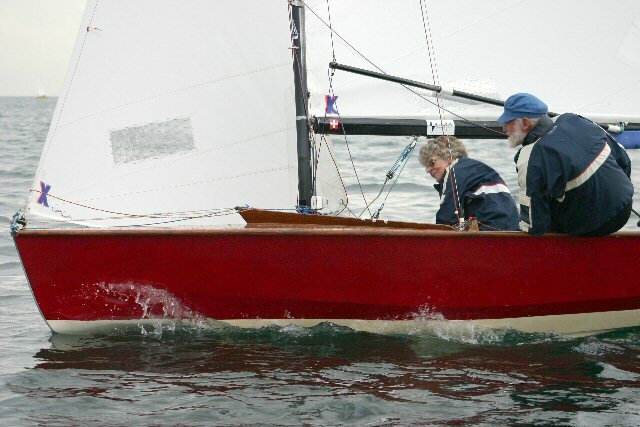 One of our elder "statesmen" at nearly 70, our covermaker and wooden boat restorer par excellence, Hans did better (23-24) in the lighter airs of races 2 and 9. This was his first Worlds in nearly 30 years. 37th: After a fine first day performance of 19-12, TSCC's Peter Kozak and Annelies Groen found the heavier going tough. They ended up with about the same placing as in Peter's 1995 Worlds debut. 38th: Brian Mills and Louis Jaillet were one of two entries who towed their Wayfarers about 1400 km. from Fredericton, New Brunswick, and won a share of the award for driving the furthest with their boat to get to their first Worlds. Louis and Brian never get to race against more than one other Wayfarer at home and have to travel nearly 1000 km. to get to the nearest regatta. Team Whiskey run … out improved markedly as the series wore on and they gained experience, ending the Worlds on a 23-24-17 run to move into the top 40 despite counting a DNC. Well done, gentlemen! 39th: John de Boer of London, Ontario, gave his new replacement knees a severe test - even in Thursday's nasty wave action where he wisely bowed out after one race. John and his wife, Dolores, never hit their top form on the water this time out - with their best result being a 22nd in the opener. But John's knee came through fine, and Dolores and John enjoyed their week among so many other Wayfarers, many of whom they hosted for John's special Worlds 2004 wine at their "land yacht" parked at PCYC for the week. 40th: Peter Ayres and son, Jonathan, of TS&CC were right in the thick of things in most races, looking to be in good form the all too many times they were ahead of us. Team Valkyrie finished 19th among North Americans, handily beating their 26th seed as they improved slightly over their previous Worlds result, a 44th in 1995. 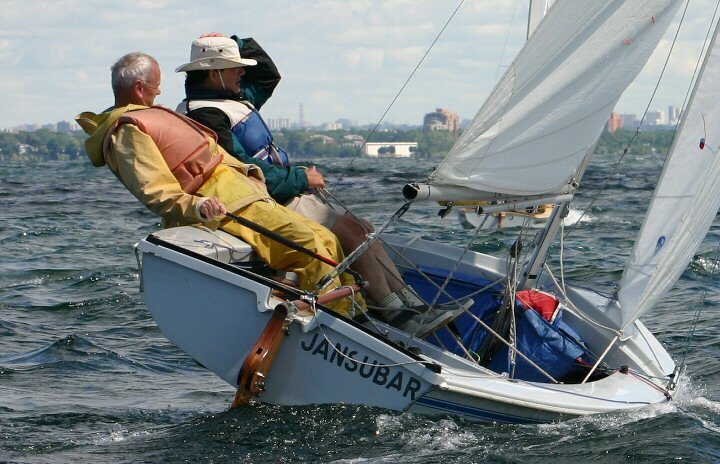 41st: Bob Kennedy and son, Scott, of London, Ontario's Fanshawe YC have usually been at their best in races on Lake Ontario, but this time they seemed to get - and stay - buried in the bigger fleet. They did however improve considerably on their only other Worlds effort, a 49th in 1995 at TSCC. 42nd: Tasmanian expatriate, Alastair Ryder-Turner of TSCC had by far the youngest crews of this Worlds. 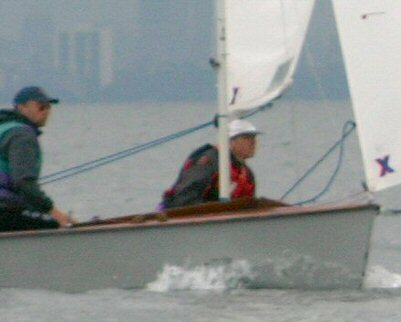 David (13) and Andrew (11) took turns, sailing on alternate days. The boys should have had an award for their fine, courageous performances in some serious, cold winds that were making many an adult participant nervous. A good rookie performance - well sailed, guys! 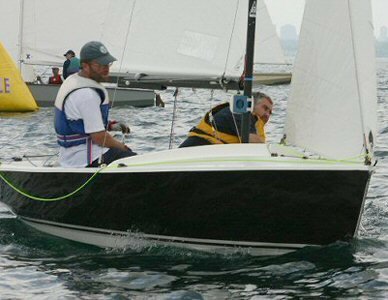 43rd: Doug Ryan and his not-so-little anymore son, Chris, of Wiarton on Lake Huron signed up for this Worlds, not knowing if dad would be able to sail due to impending heart surgery. 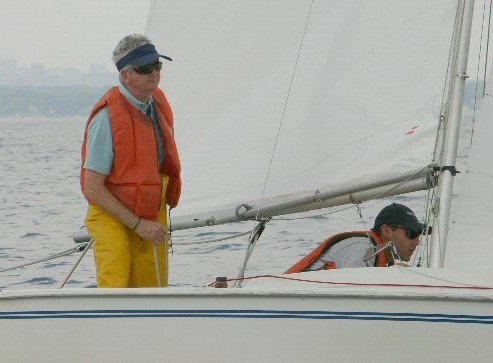 By regatta time, Doug realized it would not be wise to strain his health with a long, tough series, so he handed the helm to Chris Purtle (above left), a sailing buddy from 27 years ago that hadn't raced dinghies in 25 years. Then, wind and weather permitting, Doug would try to sail the Saturday finale. Well, the weather did permit, but Doug - seeded 23rd among Canadians - didn't just sail the race, he and Chris aced it, placing a dazzling 5th! Congratulations, Team Aliro! 44th: A good showing for the TSCC team of Dave Platt and Lou Scaglione in Splatt. In this, their first Worlds, they consistently finished in the 30's but the lack of higher finishes and good juicy drops dropped them in the overall standings. 45th: Coming nearly as far as the Brits did were Doug Honey and Becky Robson of Surrey, near Vancouver, British Columbia. 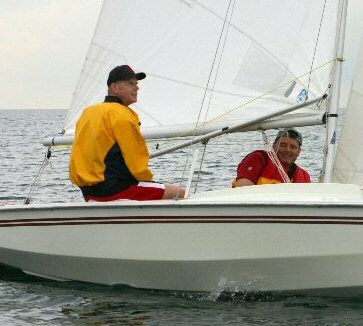 Another North American Wayfarer that rarely gets to sail against other W's, the Honey/Robson team enjoyed sailing an Abbott Mk III kindly loaned to them by Knox Ritchie. By the end of the series, Becky and Doug had No Dozer in fine form, grabbing a 26th. And they're already planning to do better next time. It's great to have you with us, Doug and Becky! 46th: One of the few North American entries to do better when it blew, were Reg and Christopher Bunt of TS&CC. This father/son team also took the not so envied award as the lowest placed boat with no letters in their finishes (i.e. no DNF's, etc.) as they moved up two places from their 1995 Worlds showing. 47th: It was a genuine pleasure to again eat and sail with Ed Gillespie and his wife, Winnie, from Aberdeen, Scotland. As expected, Ed - a man of some substance - did far better in the solid breezes in their lovely and freshly refinished (bugless!) dark-green woodie Tri Panic. 48th: Despite having mostly finishes in the 30's, the TSCC duo of Geoff Edwards and George Waller in Jansubar ended up 48th overall. No sudden moves for this team: they placed 52nd in 1995, then moved up to 50th in Egå, and this time moved up another couple spots. But at least they're headed in the right direction! 49th: Despite having rarely raced their lovely wooden W861 - not at all in the past 2 or 3 years, TSCC's Anne Armstrong and her husband, Gary, gutted it out very well in the toughest of conditions where they crossed us a few times near the windward mark. Fine sailing, Anne and Gary! 50th: Another Wayfarer coming out of mothballs for this Worlds was Jeff Cox of the Mississauga SC. Even with a fine crew in the person of his son, Barry, Jeff was a bit rusty and could not match his previous Worlds placings from Hayling in '92 (37th) or his 45th from Toronto in '95. I hope we'll see you with us more often, Jeff, now that all that rust has been washed off! 51st: Lots of new, educational experiences for our beloved Cottonwood Regatta hosts, Richard Johnson, and his wife, Michele, who made the 1200-km. drive from Charlotte, North Carolina with their two lovely daughters, Alyssa and Emily, and one chicken - and a free range chicken at that. Well, actually, a Free Range Chicken, W10139. Although their race results were not all they had hoped for, Team Chicken was anything but that, looking very good in cold winds and waves and a fleet far bigger than any they had raced in. And the young ladies enjoyed their week in the PCYC Junior Club, too. 52nd= Also making the mammoth 1400-km. drive all the way from Fredericton, N.B. were Kevin and Shirley Pegler, towing their beautifully rebuilt and freshly measured W1071 Wildwood. Uncle Al already knew Wildwood: He and Kevin had sailed her across Lake Champlain in a lovely breeze, from Button Bay, Vermont to a bar on the New York State side during last year's North American cruise rally. Kevin and Shirley handled themselves and the conditions very well, enjoying the excitement. And Shirley had the bruises to prove it, too!! (see photo above) Still, after sharing that long drive from the Maritimes with their two young kids, Kevin and Shirley no doubt felt that the hairy runs fraught with death-roll danger were a nice moment of relaxation! This was not only the Peglers' first Worlds but also their first race in a regatta, and their mission, Don't come last!! was a success. 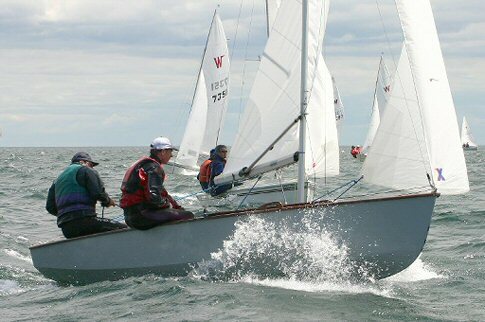 52nd= After an absence of 20+ from the Wayfarer racing scene, Toronto's Outer Harbour Centreboard Club reappeared in the form of Alan Simpkins and Dave Earley. Full marks to this team who made their Wayfarer debut in the toughest possible circumstances, and despite very basic gear, did not look out of place. Here's hoping that we will see you guys at more Wayfarer events! "My brother was kind enough on the day I sailed with him [Thursday] to let me drive the last race. Things were going good, we were up near the front at the first mark and got the spinnaker going with a nice plane taking us down to the leeward mark. All smiles and chuckles till we did the jibe and the spinnaker went all funky on us and I took him for his first swim with his new Wayfarer. The board was glass and was letting out great sounds of protest as we stood watching the parade go by. I lost my hat, my brother his water bottle, but got to keep his sunglasses, and I was left with a little pride. We got it all back together and finished the race." 55th: Three different crews for the TSCC Worlds rookie, Thomas Vendely: Zoltan Takacz, Steve Szenasi (Friday) and on Saturday, Marek Badzynski. Only a year ago, Thomas ventured out for his first spinnaker run in a Wayfarer, and here he was at the Worlds, flying the spinnaker like a veteran in very challenging winds. And in race 6, Thomas managed something that Uncle Al for one, never did achieve: Thomas crossed Ian Porter halfway up the first beat. Actually, when I enviously mentioned Thomas' feat to my ever supportive wife and ex-crew, Julia, she replied soothingly: "You did better than that in '86. You hit Ian!" "True", I shot back, "but that was before the start where anyone could still foul him." 56th: Congratulations to North Bay, Ontario's Dave Hansman and to his father, Charles. At 78, Charles may have been the oldest crew ever to sail a Wayfarer Worlds, and he hung in very well in the most trying of conditions that required very hard work from the crews. Son, Dave, was no slouch in the hard work department, either: Not only did he spend all winter bringing W282 Banshee back from the grave and add her to our great array of lovely Wayfarer woodies at the Worlds, but he also brought a supply (quickly sold out!) of his classy Wayfarer hats and T-shirts - the latter with the slogan: Wayfarer, A class act between the sheets. Banshee was duly admired at the Worlds by her original owner, Terry Gregg, a good friend of Uncle Al's next door neighbour in Oakville. 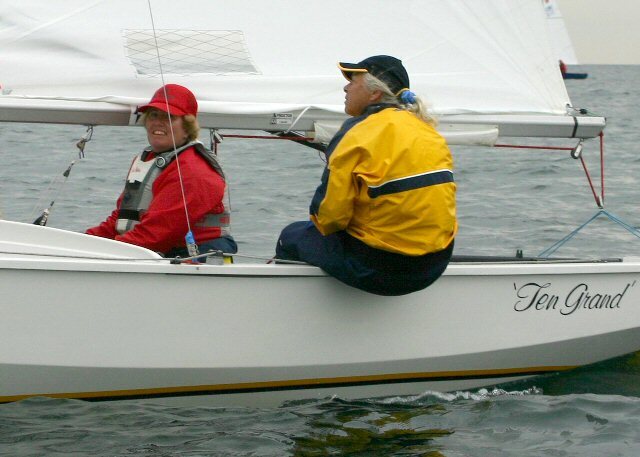 To Terry, the sight of the oldest Wayfarer in our Worlds fleet looking like new, brought back fond memories of his 1961 Canadian Wayfarer Nationals victory and other entertaining near-misses in the same black beauty. 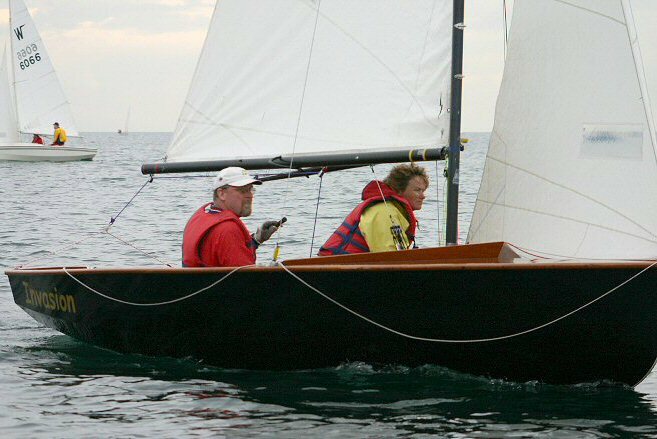 57th: Another team making their Wayfarer racing debut here were Ed Morysiak and Karin Fairbairn of TS&CC. Far from being discouraged by the tough competition and wealth of experience they were up against, Karin and Ed put that experience to good use, soaking up lots of knowledge. The end of the Worlds found them determined to race a lot more and do better. 58th: Ted Lacelle and Don McLean of TSCC were another team that was virtually new to racing. They, too, learned a lot, and sailed enthusiastically - if selectively. Of course, after the months of hard work Ted put in as a Measurer, he deserved the occasional rest! 59th: Alan Hallwood of the MSC stepped in as a last-minute fill-in for Rod Anderson to helm W3568 for crew, Rod McIver. After three races and one finish, Alan opted for photography as a drier approach to this Worlds. 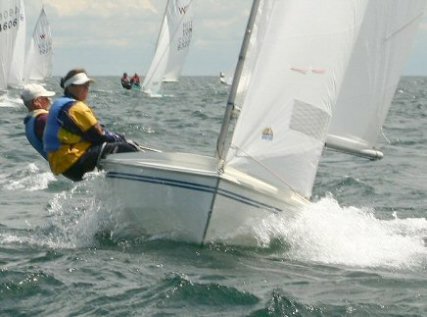 Other entries: Recent health problems prevented Paul Senechal, the lone entry from the Port Credit YC, from racing, but Paul was most definitely a part of the Worlds. In his green Shark MGB, he became a spectator boat, and - on at least one occasion - a "crash" boat, when he kindly towed Uncle Al, Marc and SHADES with her snapped rudder, back to safety at the MSC. Paul's W3140 Green Side Up also sort of participated in the Worlds. Her rudder, boom and other bits were loaned out as emergency replacements to other Wayfarers. With a smiling reference to Scavenger, the World champion Wayfarer, Paul re-christened W3140 Scavenged. 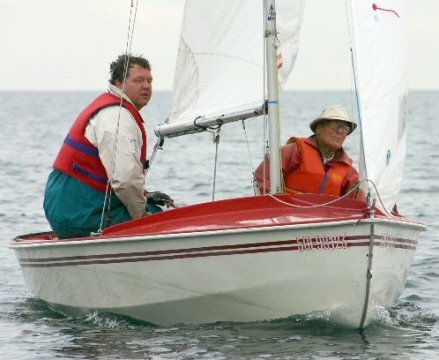 Joe DeBrincat (W1115) of Walled Lake, Michigan, had to bow out of the series when he was unable to pin down either of his very talented sailing sons to crew for him. But Joe and his young daughter, Noelle, made the long run to Toronto anyway, just to join and enjoy Friday's and Saturday's festivities.